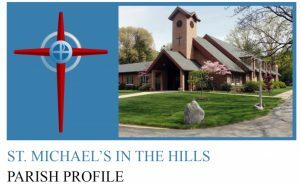 The work of St. Michael’s in the Hills is accomplished through the contributions of our staff and members working in parish committees. The committees are structured under four main task forces: Learning, Worship, Operations and Parish Life. Each committee meets regularly to identify action items and areas of concern within its scope of responsibility. Committee recommendations and requests are reported to the vestry which has responsibility for the affairs of the church. The Adult Education Committee includes planning and oversight of Common Grounds and Common Grounds for the Community, An Inquirer’sClass for those interested in learning more about the Episcopalian faith, Lenten Study and Suppers, the Parish Library and Tract Rack, and Bible Studies. The Church School Committee oversees the Sunday School program and its curriculum and supplies, coordinates the operation of the nursery, maintains a children’s library and organizes special events such as the Christmas pageant and Vacation Bible School. The Youth Committee manages the activities of our Sunday morning classes as well as our annual youth mission trips. The Spiritual Life Committee supports spiritual enrichment events including the weekly Lenten Eucharist and breakfast, small group ministry, and the Women’s Retreat. The Music Committee cares for the needs of the Senior and Youth Choirs as well as special musical events held at St. Michael’s. lay Eucharistic visits to shut-ins. The Finance Committee has oversight for budgeting and auditing and manages memorial gifts and the long-range financial plans of the church. The Personnel Committee is responsible for the human resource needs of the parish. The Stewardship Committee conducts the annual Every Member Canvas (EMS) or pledge drive. The Buildings and Grounds Committees guarantee the safe and sound operation of our parish campus and the rectory including the maintenance of structures and infrastructure. Semi-annual cleanup days known as Blue Jean Sundays are held in the spring and fall. The Garden Committee maintains the beauty our courtyard gardens and other planted areas on the property. The Memorial Garden Committee preserves the final resting place of our interred members and plans an annual memorial service. The Aesthetics Committee is charged with making recommendations regarding gifts offered to St. Michael’s; and to physical changes (whether they be decorative or functional) proposed for the grounds and interior space of our church. The committee seeks to encourage offerings which harmonize with the spiritual and aesthetic feel of St. Michael’s and its traditions. The Parish Hospitality Committee coordinates the Coffee Hour, the All Parish Brunch at the Annual Meeting, the Monday at Mike’s Fellowship Group, Punch on the Lawn, Rally Sunday, the Women’s Christmas Luncheon and other events when we gather to celebrate our community life. The Pastoral Care Committee’s responsibilities include funeral hospitality, pastoral visits, the Knit-and-Pray prayer shawl ministry and coordinating transportation for parish members who need assistance to attend services. The Communications Committee maintains the parish website, coordinates advertising and mailings, and assists with other communications tools such as bulletin boards and newsletters. The Growth Committee strives to increase membership by welcoming visitors and organizing new member gatherings. The committee is responsible for the Welcome Bags in the foyer. The Outreach Committee directs the charitable work of St. Michael’s in the Toledo area and beyond. The committee recommends recipients for the Christmas and Easter donations.